Location in Nassau County and the state of New York. Baldwin is a hamlet and census-designated place (CDP) located in the town of Hempstead in Nassau County, New York, United States. The population was 24,033 at the 2010 census. Baldwin LIRR station, originally built in 1868, is on the Babylon Branch of the Long Island Rail Road. Original inhabitants of the area between Parsonage Creek near Oceanside and Milburn Creek near Freeport were Native Americans known as the Meroke, or Merrick, a band of Lenape people who were indigenous to most of the South Shore of Long Island. They spoke an Algonquian language and lived in two villages along Milburn Creek. In 1643, English colonists began to call this area Hick's Neck, after two of Hempstead's early settlers, John Spragg from England and John Hicks from Flushing. They extended Hempstead village south to the salt meadows. The grist mill built by John Pine in 1686 on Milburn Creek attracted more English settlers. They engaged in fishing, farming, marshing, raising longwood, and breeding and raising sheep. Between the American Revolutionary War and the War of 1812, Hick's Neck continued to grow, becoming a prosperous agricultural area. The first churches were built in 1810 and 1872, and the first school was built in 1813. Sometime around the early 19th century Hick's Neck had begun to be called the village of Milburn; the first documented use of the name Milburn was in 1839. In 1855, the village was officially founded as Baldwinsville, named in honor of Thomas Baldwin (1795–1872), a sixth-generation member of the Baldwin family of Hempstead and the leading merchant of Milburn at the time. Baldwin owned a general store named T. Baldwin and Sons. He also had a hotel at what would now be considered the northwest corner of Merrick Road and Grand Avenue. A third enterprise was his sawmill, which he operated by Silver Lake just southeast of the hotel. In 1867, the South Side Rail Road began operating with a station in Baldwinsville. In 1870, one of Thomas Baldwin's sons, Francis Baldwin, became a member of the New York State Assembly representing Queens County's 2nd District; he later served as the Queens County treasurer. 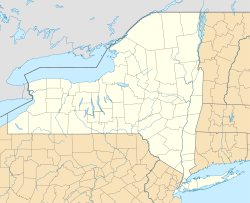 (During this time, Baldwinsville was part of Queens County.) A year later, the name of the village was changed from Baldwinsville to Baldwins by the U.S. Postal Service so as to not confuse it with the village of Baldwinsville in upstate New York. By 1892, by an act of local government, the village was officially named Baldwin. Shortly after Hempstead separated from Queens County in 1899, people began to move to "Beautiful Baldwin", as it was called by Charles Luerssen, a village realtor. The village had fine boating (sailboats), bathing, and fishing. By 1939, ten years after the opening of Sunrise Highway, Baldwin became the largest unincorporated village in New York State—a title that was lost to Levittown by 1960. In the 1990 US Census, the area south of Atlantic Avenue was designated as Baldwin Harbor, a hamlet (and census-designated place). Baldwin Harbor remains a part of the Town of Baldwin's ZIP code, school district, and library system. In May 1910, a breakthrough in American aviation history was made in Baldwin. The first all-American monoplane was designed, built, and successfully flown at this location by brothers Arthur and Albert Heinrich. The project was developed at the site now occupied by the Plaza Elementary School on Seaman Avenue and Rockville Drive. In the plane's initial and subsequent models, its unique designs featured controls that were combined into one stick, which allowed the pilot to fly the plane using one hand. The community is located in the southwest part of Nassau County. It is located on what is known as the South Shore of Long Island. Baldwin is located at 40°39′48″N 73°36′38″W﻿ / ﻿40.66333°N 73.61056°W﻿ / 40.66333; -73.61056 (40.663346, -73.610618). According to the United States Census Bureau, the village has a total area of 3.0 square miles (7.8 km2), of which 0.34% is water. There were 1,200 people in the community of Baldwin in 1882, 1,500 in 1890, 5,000 in 1920, 12,000 in 1930, 15,000 in 1940, and 31,630 in 1980. As of the census of 2010, there were 23,455 people, 7,868 households, and 6,081 families residing in the village. The population density was 7,954.4 per square mile (3,069.8/km²). There were 7,999 housing units at an average density of 2,712.8/sq mi (1,046.9/km²). The racial makeup of the CDP was 39.8% Non-Hispanic White, 34.6% African American, 20.2% Hispanic or Latino, 4.2% Asian, 0.2% Native American, 0.02% Native Hawaiian and Other Pacific Islander, 8.2% from other races, and 3.9% from two or more races. There were 7,868 households out of which 38.3% had children under the age of 18 living with them, 61.0% were married couples living together, 12.7% had a female householder with no husband present, and 22.7% were non-families. 18.5% of all households were made up of individuals and 9.3% had someone living alone who was 65 years of age or older. The average household size was 2.98 and the average family size was 3.40. In the community, the population was spread out with 26.1% under the age of 18, 7.2% from 18 to 24, 30.5% from 25 to 44, 24.1% from 45 to 64, and 12.0% who were 65 years of age or older. The median age was 37 years. For every 100 females, there were 89.9 males. For every 100 females age 18 and over, there were 85.2 males. The median income for a household in the community was $72,456, and the median income for a family was $79,400. Males had a median income of $52,069 versus $41,496 for females. The per capita income for the CDP was $29,114. About 1.1% of families and 1.4% of the population were below the poverty line, including 3.5% of those under the age of 18, and 2.1% of those aged 65 or over. As of the census of 2000, there were 23,455 people, 7,868 households, and 6,081 families residing in the village. The population density was 7,954.4 per square mile (3,069.8/km²). There were 7,999 housing units at an average density of 2,712.8/sq mi (1,046.9/km²). The racial makeup of the CDP was 41.3% White, 37.9% African American, 15.6% Hispanic or Latino, 2.1% Asian, 0.8% Native American, 0.3% Pacific Islander, 4.60% from other races, and 3.03% from two or more races. The median income for a household in the community was $71,456, and the median income for a family was $78,400. Males had a median income of $51,069 versus $40,496 for females. The per capita income for the CDP was $28,114. About 3.3% of families and 5.4% of the population were below the poverty line, including 5.5% of those under the age of 18, and 7.1% of those aged 65 or over. Baldwin has its own school district, officially named the Baldwin Union Free School District (formerly Union Free School District No. 10, Town of Hempstead). The boundaries of the Baldwin School District are not identical with those of Baldwin itself, also containing the Stearns Park neighborhood of Freeport, up to Knollwood Road in Rockville Centre (which is a few blocks away from South Side High School) and a few blocks from other neighboring villages. A small portion of Baldwin, located to the West of Silver Lake, is included in the Oceanside Union Free School District. As of September 2012, the Baldwin Public Schools consist of seven schools with a total enrollment of approximately 5500 students. There is one high school, Baldwin Senior High School, and one middle school, Baldwin Middle School. There are five elementary schools spaced throughout the town: Brookside, Lenox, Meadow, Plaza, and Steele. Baldwin Senior High School is a Nationally Recognized School of Excellence, and as of 2011, is the eighth-largest high school in Nassau County, New York. Baldwin Senior High School was ranked by Newsweek in its annual list of America's Best High Schools. In 2010, it was ranked #837 in the entire United States, #804 in 2008, #971 in 2007, and #602 in 2006. The high school offers a multitude of extracurricular clubs, varsity sports, and a robotics team. Baldwin Senior High School offers Advanced Placement courses that may enable students to earn college credit, and the school produced two National Merit Commended Students, who achieved scores in the top 5% of the more than 1.5 million students who took the PSAT in 2009. The high school is located near the north-central part of town, and the middle school near the south end. Buses are run to both of these schools. Most students are able to walk to their elementary schools. The elementary schools contain kindergarten to fifth grade. The middle school contains grades six through eight—but the sixth graders spend most of their time in a separate wing except for music, gym, lunch, arts, computers, technology, and language. The high school contains grades nine through twelve. Three former elementary schools were closed in June 1980: Prospect School was torn down, along with the former Baldwin Junior High School and former Baldwin Senior High School which were combined in one building in the 1980s to make way for a housing complex; Coolidge School on Grand Avenue has been converted to condominiums; Harbor Elementary School on Hastings Street is now the school district office building. Two additional elementary schools, Milburn and Shubert, were closed in June 2012 as the result of enrollment changes and cuts in state funding. The district is governed by a five-member elected board of education. Dr. Shari Camhi is the superintendent of schools. Baldwin also has one Catholic school, St. Christopher's. This school was established in 1925 as part of St. Christopher's parish. The school serves students from Baldwin, Freeport, and surrounding areas, and it ranges from kindergarten to eighth grade. Although originally staffed by the Sisters of St. Joseph of Brentwood, most of the school's faculty consists of lay people. Originally the school was one building that housed all classes, however it has been expanded twice. The school now consists of the "original building" (now housing classrooms, a gym, stage, computer lab, and music room), the "middle building" (housing the school and religious education offices, classrooms and an art room), and the "new building" (housing a cafeteria, library, and classrooms). Over the years the school has gained a highly regarded reputation in the Baldwin community. Students from the school participate in a wide variety of both Catholic and community events. For example, students take religion classes from kindergarten to the eighth grade, as well as march in the Baldwin Memorial Day Parade and help out at Baldwin's Big Sweep (a community event in which volunteers clean up Grand Avenue). Dee Snider - singer-songwriter, screenwriter, radio personality, and actor; most famous for his role as the frontman of the heavy metal band Twisted Sister (Baldwin class of 1973). Scott Rudin - film producer and theatrical producer; in 2012, became one of the few people who have won an Emmy, Grammy, Oscar and Tony Award, and the first producer to do so (Baldwin class of 1976). Taylor Dayne - singer who has seven Billboard Top Ten hits; also known as Leslie Wunderman (Baldwin class of 1980). James McLurkin - Professor of Robotics and Electrical Engineering at Rice University. Earned SB (EE) and PhD (CS) at MIT, MS (EE) UC Berkley (Baldwin class of 1990). Chris Weidman - NY State Wrestling Champion; two-time D-1 All-American wrestler at Hofstra; professional mixed martial artist Former UFC Middleweight Champion (Baldwin class of 2002). Melanie Martinez - singer/songwriter who placed sixth on season 3 of The Voice (Baldwin class of 2013). The soldiers who were posthumously awarded the Medal of Honor. First Lieutenant Bernard J. Ray deliberately gave his life to spare his men of Company F, 8th Infantry, 4th Infantry Division on November 17, 1944 in the Hurtgen Forest. Specialist Five John J. Kedenburg (BHS '64) was serving with a long-range reconnaissance team of South Vietnamese irregular troops while a member of the U.S. Army 5th Special Forces Group (Airborne). When his group came under attack and was encircled by a battalion-size North Vietnamese Army force, Kedenberg conducted a rear-guard action which allowed his group to break out of their encirclement and move to a landing zone. While in the landing zone, Kedenberg directed the defense of the L-Z and ultimately gave up the last chance of evacuation to one of his Vietnamese comrades. Baldwin is home to many public parks, including Baldwin Park, Coes Neck Park, Baldwin Skate Park (located within Baldwin Park), Lofts Pond Park, and Silver Lake Park which is in Oceanside also. Baldwin Park, located at the southern terminus of Grand Avenue in Baldwin Harbor, is run by the Town of Hempstead, and offers a multitude of recreational facilities, including basketball, handball, paddleball, tennis, volleyball, spray pool, soccer, softball, baseball, playground, game tables, play equipment, sitting area, shuffleboard, bike paths, roller rink and Baldwin Skate Park. ^ "Race, Hispanic or Latino, Age, and Housing Occupancy: 2010 Census Redistricting Data (Public Law 94-171) Summary File (QT-PL), Baldwin CDP, New York". U.S. Census Bureau, American FactFinder 2. Archived from the original on September 11, 2013. Retrieved October 4, 2011. ^ "Hick's Neck: The Story of Baldwin – 1. The Birth of Baldwin". Baldwin Fire Department. baldwinfd.com. Retrieved 2018-07-27. ^ "Hick's Neck: The Story of Baldwin – 2. From Settlement to Revolution". Baldwin Fire Department. baldwinfd.com. Retrieved 2018-07-26. ^ a b "Hick's Neck: The Story of Baldwin – 3. Into the 1800's, part I". Baldwin Fire Department. baldwinfd.com. Retrieved 2018-07-27. ^ a b "Baldwin History". Baldwin Public Library. June 16, 2011. Section, "The History of Your Home Town by Helen MacDonough". Archived from the original on 2015-07-11. Retrieved 2018-07-25. ^ a b "Hick's Neck: The Story of Baldwin – 4. Into the 1800's, part II". Baldwin Fire Department. baldwinfd.com. Retrieved 2018-07-26. ^ "Hick's Neck: The Story of Baldwin – 5. 1900 to the Present". Baldwin Fire Department. baldwinfd.com. Retrieved 2018-07-26. ^ Data Access and Dissemination Systems (DADS). "American FactFinder - Results". census.gov. Retrieved 7 March 2015. ^ "Baldwin, New York (NY) profile". city-data.com. ^ "Chris Weidman UFC Bio". Retrieved 2014-01-01. ^ Lyall, Sarah (July 18, 1993). "'Amongst Friends' Tops Off a Journey Of Self-Discovery". The New York Times. p. 10. Retrieved September 18, 2008. ^ "Harry Kiesendahl's Obituary on Newsday". Newsday. Retrieved 2018-06-03. Wikimedia Commons has media related to Baldwin, New York. This page was last edited on 17 March 2019, at 02:22 (UTC).